an evergreen shrub or tree native to the Mediterranean. region, cultivated for its edible seedpods since 2000BC. The Carob tree is an evergreen tree with large, shiny leaves which can grow up to 45 feet tall. The Carob tree can live to be over 100 years old. The tree produces thick, long or short, broad pods that are from 6 to 12 inches long. The pods are green, turning dark brown/black when ready to be picked. Inside the pods, surrounded by a sweet, juicy pulp, are reddish-brown seeds that look a bit like watermelon seeds. There could be up to 9 seeds per pod. Though the pod can also be eaten raw. The whole pod is used: the pods are roasted and ground into a powder; the pods are also used as animal feed in kibble/crumb form and the pods. The Carob Powder is made first, then products such as syrup, bars and chips are made from the powder. The carob seeds are also used to make Carob bean gum and is used in food manufacturing as a thickener for icecream, toothpaste, diabetic chocolate spreads etc....The Carob Tree is a native to the Middle East. It has been cultivated since 2000 BC. The fruit is a pod which can be elongated, compressed, straight or curved, and thickened at the sutures. Carob is a member of the legume family, and as such its roots host bacteria which convert atmospheric nitrogen into nitrates which can be used by plants to make proteins. Bionulpro (Carob Flour) has a high natural carnohydrate content 30-35% and is totally starch sugar free. Its protein content is about four to eight percent. The crude fiber content is four to six percent. Neutral detergent fiber (NDF), averaging 35.5 percent is mainly composed of lignin and cellulose, with a low hemicellulose content. Pectins and soluble tannins are up to 3-5.0 percent. The gross energy value of Bionulpro (Carob) is 3,600 Kcal/kg. The digestibility energy (DE) of dehydrated carob powder for pigs and rabbits are 2,440 and 2,235 Kcal/kg, respectively. There are in total approx 211 species of carob and each one has a completely different nutritional value. Our Raw Carob has a long-chain fatty acid (LCFA) proportions in terms of the saturated to polyunsaturated fatty acid (SFA: PUFA) and n-6 to n-3 ratios. 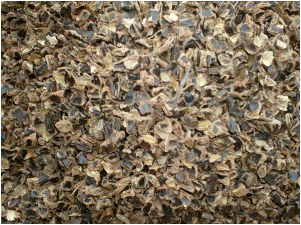 Our Natural Carob is totally STARCH FREE so great for horses/ponies with an intolerance to sugar and/or starch. Carob tannins have Gallic acid. Gallic acid is analgesic, antiallergic andantibacterial. It is also antioxidant, antiviral and antiseptic.